You are here: Home Forum Home Stern Drives Mercruiser 888 Ford 302... what is this thing? Mercruiser 888 Ford 302... what is this thing? TOPIC:	Mercruiser 888 Ford 302... what is this thing? What is the little square box with the two screws in it? I need to replace yhe wieing in it and would like to know what it is befot tinkering with it... thanks in advance. NooooÃ¢ÂÂ¦Ã¢ÂÂ¦ you did not post on the wrong area for now. You got attention, one of the moderators can always change the thread place. Those wiring systems are pretty straight forward and easy to trace. As long as you are replacing the wires just untape(?) the bundle and see where the wire goes. Are you getting a complete new harness or just replacing each wire as you proceed? I would just unscrew the rusty fasteners and see what's inside, if anything just for curiosity. As you can tell I don't know jack about this particular setup but it is where I would start. Good luck with your project and keep us posted. That 302 is a strong runner and was a followup of the Ford 289 (which I had in my 67 XL convertable) and can be reworked to some serious speed and HP. Well I see I did a duplicate post... Darn it! New Ipad and still getting use to one finger typing and posting pics with this thing. My apologies. 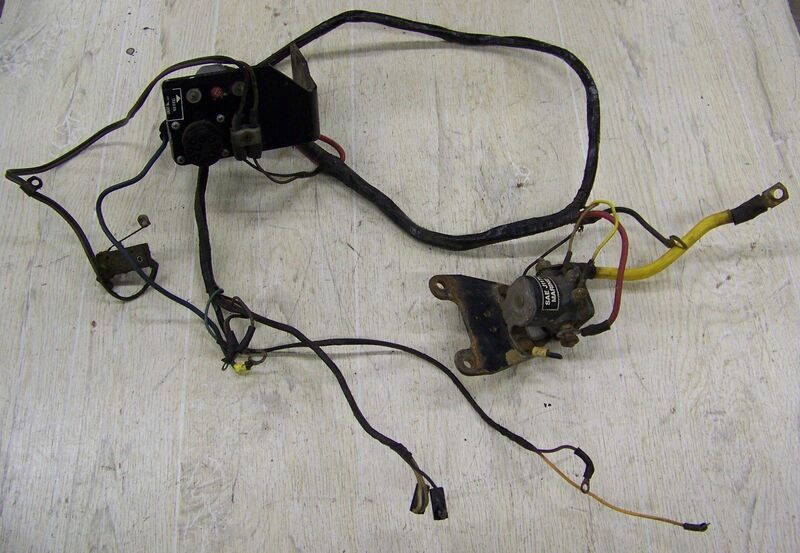 Thank you so much for posting up the pic of the wiring harness. There were no wires coming from that one either so I think im jist going to forgo that connector that goes nowhere. Thanks again. Well, it really looks doesn't look like Mercury installed it. 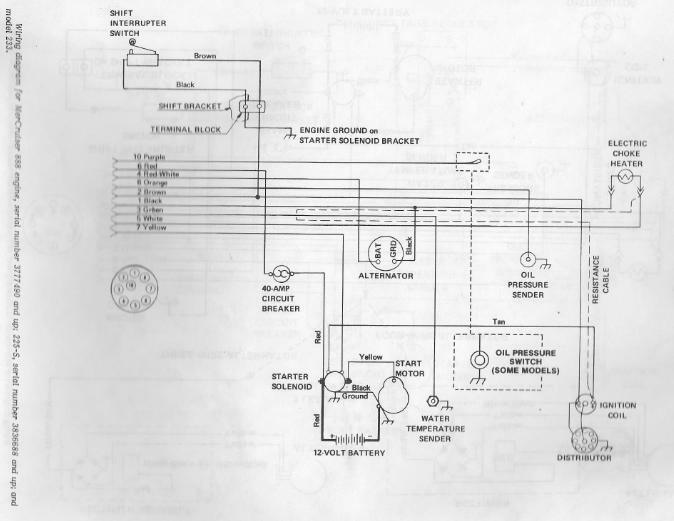 I have attached a 888 wiring diagram for the later series, (my book does not show the early series) and I can't identify it on the diagram. It would be interesting to take it apart and see what it is. It looks like it may be a resistor. The 888 series that use points do use a resistor wire from the choke to the + terminal on the coil. This may have been a PO attempt at fixing a burned resistance wire. If you have a distributor with points and you want to see if your resistance wire is working, there should be three wires on the choke terminals, a black on one, and a white and another color that is the resistance wire. The diagram does not specify the color. Remove the resistance wire from the choke terminal and the + coil terminal. The coil terminal should also have a tan wire that comes from the starter solenoid. It bypasses the resistor for easier starting. Check the resistance on the wire. It should be about 2.5 ohms. If it's OK, ignore the mystery box. If you have no (0 or close to it) resistance someone has bypassed the resistance wire. Excessive idling will overheat the coil, and a high RPM miss could occur from too little dwell time. Any automotive ballast resistor close to 2.5 ohms will work in its place. This is a wire harness for sale on line and it too doesn't have any wires other than those two wires going to it. I removed it tonight and its just a junction box. There are two insulated connectors and the box just holds the wires up against the mount. Much like the plug wires are ran through hold down to keep them in place? I had this thing running last summer so im convienced they are for some optional electrical device... Tach or something else? The shift interrupter switch does what? Kinda looks like the the wiring goes through that? Sorry, I didn't realize you had two posts on the board. Seeing the second one, and a little searching on ebay, pretty well answers the question. If you look at the wiring diagram you will see a terminal block near the shift interrupter switch. It has two brown wires from the switch, and one brown wire going into the wire harness. The fourth wire (color not specified, but probably black) goes to ground on the starter solenoid bracket. If you look at the attached pic you can see how it's all laid out. It shouldn't be hard to replicate the wiring for the circuit. I did find other 888 wiring harnesses on ebay and one showed a solenoid bracket that did not have the terminal block, but there were two holes in the bracket for mounting it. That may indicate the difference between early and late models may have be the switch and terminal block configuration. Ok think I got it figured out now ... just checked and the micro switch is still in place. Ineed to power wash it all then I can dig in and ops check the switch and see what needs to be hooked up. Thanks again for the help. It is Mercury installed part. Later ones were dark plastic. If I recall, it holds 2 bullet spliced wire pairs together so the bullets don't slide apart. They bypassed the trim limit switch.